Hello Everybody. Autumn the Puppy here! Believe it or not, I was sent some very interesting photos of the recent Royal wedding between Prince William and Catherine Middleton! I don't know where the person who sent them to me got them from, but as far as I have been able to ascertain, these are genuine images and have not been altered in any way. As you can see by the top photo, members of the Royal Family are watching the newlyweds passby on the way to their weekend getaway as husband and wife. 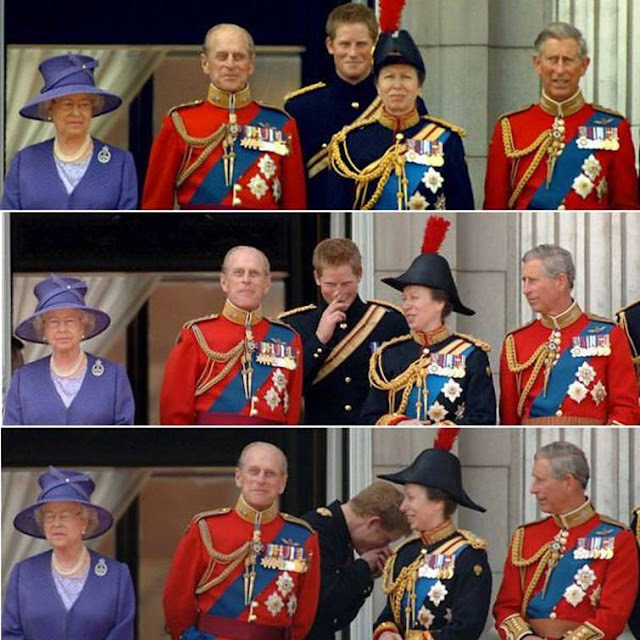 But in the middle photo, something must have happened, for there is a clear and obvious reaction by almost everyone by the time the last photo was taken, although you must admire the "stiff upper lip" expression on the face of Queen Elizabeth on the far left. Modesty forbids me from commenting further on the possibilities of what must have happened, although I'm sure it passed in time.